Since the dawn of time, people have told stories to entertain, inform, and pass on cultural values. They have also used stories to persuade. In today's fast-paced world, corporations use stories to sell products and gain a competitive advantage. Political parties use stories to elect candidates and garner support for controversial policies. Military leaders use stories to inspire courage and foster unit cohesion. Social activists, educators, environmentalists, economists, religious leaders, and a host of others use stories to promote their views and agendas. 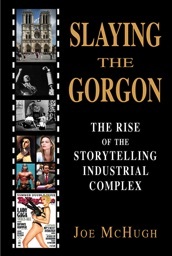 Slaying the Gorgon is a fascinating and provocative multimedia presentation by storyteller, writer, and public radio journalist Joe McHugh that looks at how stories are told in the modern age given the dynamic and transforming influence of new technologies. 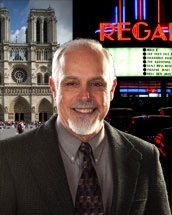 From the venerated saints and cathedrals of the Middle Ages to the pop stars and cineplexes of today, he explains why images and sound are increasingly supplanting the authority of the printed word and, by so doing, radically altering the cultural, economic, and political landscape in the United States and around the world. What does the ancient myth of Perseus and Medusa teach us about the nature of storytelling and its power to influence our beliefs and behaviors? Why do political candidates need the blessing of film and television stars/saints to get elected? Does the spread of electronic media cause societies to become more tribalized? How does today's industrialized storytelling overstimulate and exhaust the imagination and what can we do about it? These are some of the questions McHugh explores using a combination of common sense language, intriguing images, and humor. His goal is to provide an opportunity for reflection and discussion about these vitally important issues of the day. Slaying the Gorgon can be designed to be a sixty or ninety minute multimedia keynote presentation followed by Q & A. Department of Education and the California Attorney General's Office.